October 2012 – A Write Old Life. Why I blog… or more importantly, why I WILL blog! Someone asked me the other day what, if anything, was the point of a blog. Now admittedly, the person concerned isn’t the brightest of buttons and so it was pointless my trying to explain the complexities of social networking and eBook marketing so I simply said ‘it’s a giggle.’ An answer which met with one of those grunts which suggested that I’m a pretentious self-important git. Which could be considered to be a fair point. However, as I reflected on the conversation later, it struck me that I have actually kind of lost sight of why I actually do blog. Because as the blurb on the right of this screen says all too clearly, one of the primary aims of this exercise was to provide a platform for me to let off steam. Or in other words, to rant. I then realised that if that was my mission statement, I’ve recently been failing miserably. For instead of blogging when something pisses me off, I’ve taken to writing about it on Facebook which all too often results in my being dragged into debates with people who, in far too many cases, shouldn’t be allowed unsupervised access to any kind of electronic device let alone the internet. But then I realised that there is another reason. And with it comes an admission. You see ever since I started writing, I’ve held back. Not in my books obviously, but whenever I’ve written anywhere else. In addition, I’ve refused point blank to speak about certain subjects on either radio or TV and have similarly declined requests to provide quotes or interviews for newspapers. The reason is that I’ve been scared. Scared of damaging any hope I might have of a career in the media by saying something that someone sitting in an office somewhere judges to be too far over the line. In short, I’ve been something of a coward. I was discussing this at football yesterday with my mate Neil and it suddenly struck me that my cowardice has backfired. Not because if my move into the media mainstream was going to happen it would surely have happened by now, but because I have been letting myself down. Equally, I have been letting other people down. For over the last couple of years, one thing I have come to realise is that whilst my opinions on everything from life generally right through to the state of the country might not sit well with the liberal left who rule the media, they do reflect those of the vast majority of people I talk to. Be they in the street, at games, within my own family and even, bizarrely, at a British Film Institute event! In many cases, those people are frustrated. Frustrated because their opinions are not simply being ignored, they aren’t even being aired. And as someone who shares that frustration, surely I, as a writer with a profile of sorts, should be the one giving those opinions, my opinions, that voice. Of course I bloody should! So from this point on (or at least from when I come back from my holiday), I promise that when I blog, be it related to anything from poppy burning filth, racist footballers or useless lying politicians, I won’t hold back. If I think it, I’ll write it. And more frequently. Even making this statement, I feel cleansed. More importantly, I feel unleashed. The Crew. Still #1 even after a whole year! Finally…. just a quick word on the subject of books. Thanks to everyone who continues to keep The Crew and Top Dog so high in the charts. 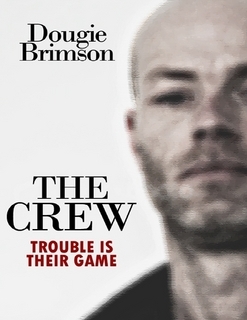 The success of The Crew in particular has stunned everyone but then again, it is a bloody good read. If you haven’t read it, it’s still free so why not give it a try. You have nothing to lose… other than the £2.50 it will cost when you buy Top Dog afterwards. Which of course, you will! Won’t you!